One of my favorite 2016 job was speaking at various cinema clubs throughout the Tristate Area, especially when they were screening films I dug. 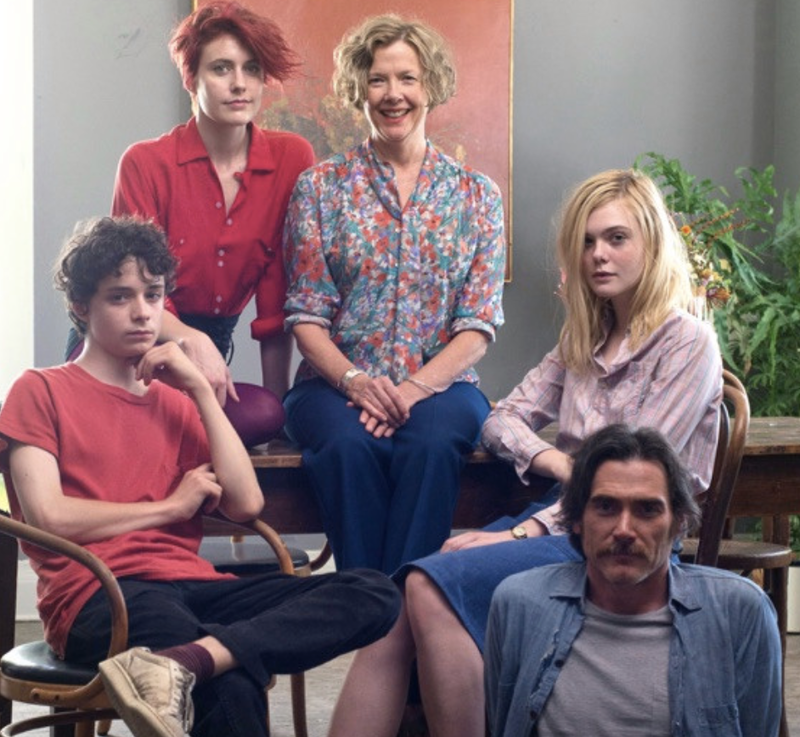 I especially adored “20th Century Women,” Mike Mill’s loosely autobiographical drama about his relationship with mom, sisters, and Southern California (in that order, basically). Here’s a transcript of a speech I gave about the film a few times. I don’t know how many of you saw Beginners, which won Christopher Plummer a richly deserved Oscar, but that movie, which I adored, was based on director Mike Mills’ relationship with his father, who came out in his 70s after his wife, Mills’ mom, died of cancer. This one is an autobiographical homage to Mills’ mother, and her matter-of-fact amusement grounds this film, giving it a depth that I hadn’t known I longed for in a director I already admired so much. Like the work of Wes Anderson and some other Generation X filmmakers, Mill’s films feel like a kaledescope or a collage or what younger people call “mix tapes.” Those droll photo stills–those quick montages of Jimmy Carter and red lipstick and punk rockers–make us feel like we’re pouring through a cool kid’s notebook or a terrific photo album, only for the whole country rather than a specific family. In this film, time is a central character, but only as a way of understanding the gap that exists between people we love, especially people of other generations. That is why characters here introduce other characters’ pasts and futures in voiceovers; they are constantly trying to comprehend each others’ stories. Dorothea is not only informed by being a Depression Baby but by the late 40s and 50s films that she loved –you believe her completely when she says she plans to marry Bogie in her next life. But she’s also endearingly trying to understand the present era so she can understand her son, and just as heartbreakingly, he is quietly trying to understand the past so he can understand her–notice how many times he says “she was born in the depression,” and how fascinatingly double-entendre that term sounds every time he utters it. On top of this we can see how Mike Mills is reeaxaming his past which is these characters’ present–not only the cultural artifacts that formed his artistic sensibility but the way that the 1970s were a bridge decade–the last hurrah of a counterculture that began in the late 40s with Kerouac’s generation and really ended with Reaganamics and the Hostage Crisis and AIDs. I love the way the late 70s energy crisis is used as a springboard to reflect on a nation increasingly driven not by community but by greed. In some ways, the heart of this film is when everyone gathers around the TV for Jimmy Carter’s speech about materialism and spiritual emptiness. It’s a speech that gives me chills now, though we all know how little lasting impact that warning had. Mills even co-opts a sequences from Godfrey Reggio’s apocolyptic Koyaanisqatsi there, to foretell the national turmoil that is right around the corner. Mills has said he was also influenced by Fellini and Alain Resnais in making this ensemble film, but in the snappy dialogue and timing, I can also see the 40s films his mother loved so much. You can also see those movies course through Annette Bening’s Oscar-worthy performance as Dorothea. Bening may be the only actress working whom you can imagine in those great screwball dame movies with Barbara Stanwyck and Katherine Hepburn and Irene Dunne. With her upright posture and snapdragon delivery, she seems so other-era, especially since she is one of the only American actresses her age who has not succumbed to the humiliations of plastic surgery.As long as we’re throwing accolades, I have to say this is the best I’ve ever seen Greta Gerwig, who plays Abby. Often I find her a little too precious, especially in the Noah Baumbach movies. Here she is fierce and melancholy and generous and her punk rock dancing–all ultra violet colors and long limbs– made me want to get out of my seat and join her. really makes this film special is its unique valentine to how women’s liberation could make everyone more compassionate and more complete –men as well as human. Mills based Abby and Julie on his real-life sisters, one of whom really had cervical cancer, and that may have helped him create a film with such wonderfully three-dimensional female characters. I see ’20 Century Women’ as reaching across time and space to connect all of us of different ages who desperately wish to see each other as people rather than cardboard cutouts. And I wish more filmmakers were brave enough to make movies like this–ones that are not time capsules so much as time machines, ones that are nonsequential but not nonsensical, ones that concern themselves with emotional communion rather than conventional plots.